With my Guru Sri. Vijayarajan Master– at his Sangeetha Kalanikethan one of the oldest music school in Kochi, which started in 1954. My Guru Sri. 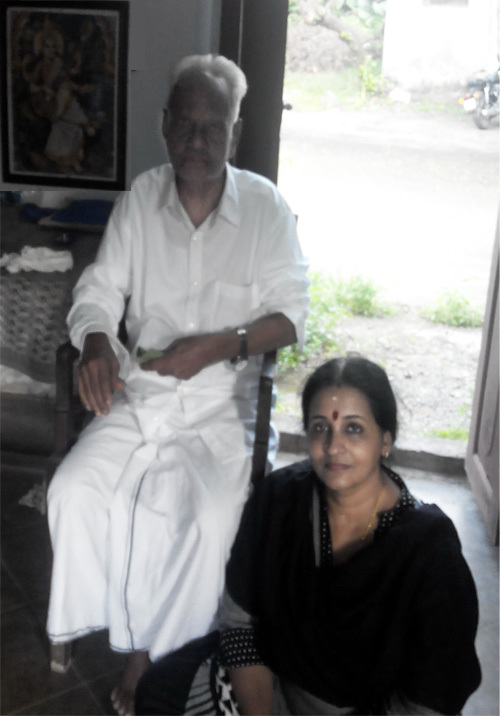 Vijayarajan Master is now 89 and it was a memorable evening for me yesterday. As he used to tell me years before, yesterday also he told me that practice and hard work is the only way to reach success and advised me never to deviate or shift the focus from the divine art and the rich tradition of Carnatic Music to the by-products of success like name, fame , money etc .He is such an eminent musician who is ever simple and highly disciplined. I am passing on his advice to my students / disciples. Vijayarajan Master used to sing together with the eminent musician M.R.Sivaraman Nair who was also his GURU. The legendary musician Sri. T.K.Govinda Rao was his friend and both Sri. Vijayarajan Master and TKG used to give concerts together. Sri. Yesudas–the legendary playback singer as a teenager used to visit his school for taking music lessons. In fact, Vijayarajan Master believes that his life would have taken a different turn had he acceded to Govinda Rao’s suggestion that he join him in Madras. “He asked me to come over and stay with him. This would have enabled me to further my training in music and would have also opened a lot of doors. But somehow it did not happen.” says my Guru. Pranaams at HIS LOTUS FEET.